Recombinant Pig interleukin-8 (PPP024) detected using Rabbit anti Pig interleukin-8 (AHP2392) as the capture reagent and Rabbit anti Pig interleukin-8:Biotin (AHP2392B) as the detection reagent followed by Streptavidin:HRP. Rabbit anti Pig interleukin-8 antibody recognizes porcine interleukin-8 (IL-8), also known as CXCL-8. Porcine IL-8 is an 11.63 kDa cytokine belonging to the chemokine C-X-C family. Porcine IL-8 is a chemotactic cytokine secreted by a range of cell types such as macrophages, endothelial cells and epithelial cells in response to inflammation. IL-8 induces chemotaxis of neutrophils and granulocytes to sites of infection. Antisera to pig interleukin-8 were raised by repeated immunisation of rabbits with highly purified antigen. Purified IgG was prepared from whole serum by affinity chromatography. This product may be used as a detection antibody in a sandwich ELISA together with AHP2392 as the capture reagent. Recombinant Pig interleukin-8 (PBP024) may be used as a standard. This product may be used as a capture antibody in a sandwich ELISA together with AHP2392B as the detection reagent. 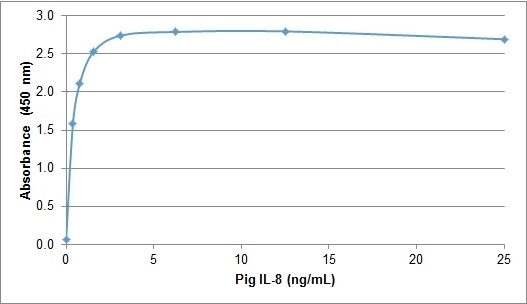 Recombinant Pig interleukin-8 (PPP024) may be used as a standard.